Chirality is an important aspect of life. This is so because many of metabolites used in living cells, in particular amino acids that form enzymes, are also chiral. Chirality contributes asymmetry to molecules, allowing them the ability to recognize “handedness” and further add to the complexity and specificity of reactions. Organic chemists must pay constant attention to the chirality of molecules both before and after reactions, less the compounds lose their biological or chemical activity. We at StudyOrgo have developed clear cut explanations of Orgo Chem material for students to maximize your time studying and learn these difficult concepts quickly and easily. Sign up with StudyOrgo.com today for all of your organic chemistry studying needs! Molecules, like your hands, that are not superimposable on their mirror images are called chiral objects, from the Greek word cheir (meaning “hand”). All 3D objects can be categorized as either chiral or achiral. Chemical molecules are 3D objects and can also be classified in this way. To help you remember, chiral molecules are like hands and are NOT superimposable on its mirror image while achiral molecules are like tennis rackets: they are superimposable on their mirror images. IUPAC recommended in 1996 that a tetrahedral carbon bearing four different groups be called a chirality center. Many other names are commonly used include chiral center, stereocenter, stereogenic center, and asymmetric center. They all mean the same thing, a carbon connected to 4 unique substituents that is not superimposable on its mirror image. When a compound is chiral, it will have one opposite molecule; a non-superimposable mirror image, called its enantiomer (from the Greek word meaning “opposite”). The compound and its mirror image are said to be a pair of enantiomers. The word “enantiomer” is analogous to the word “twin”. When two children are identical twins, each one is said to be the (“evil…”) twin of the other. Similarly, when two compounds are a pair of enantiomers, each compound is said to be the enantiomer of the other. A chiral compound will have exactly one enantiomers, all other molecules with the same molecular formula and constitutional arrangement are diastereomers, but are only seen when there are more than two chiral centers in a molecule. In order to determine whether the stereocenter is in the R or S configuration, there are a series of steps to follow. This one is easy for most, but just look for any carbon with 4 substituents that are different. Be careful to carefully count chain lengths and identify unique elements. Step 1: Assign priority of bond based on atom atomic number of the element, highest (1) to lowest (4) weight. For 2-methyl-3-pantanol, oxygen is highest priority and hydrogen is lowest priority. However, 2 carbons are connected to the stereocenter, therefore count the number of bonds connected to each carbon center. In this case, the carbon with 2C and 1H has higher priority than the carbon with 1C and 2H. For the haloalkane, oxygen is highest priority and hydrogen is lowest priority. However, 2 carbons are connected to the stereocenter, therefore count the number of bonds connected to each carbon center. In this case, the carbon with 1Br and 2C is higher priority than the carbon with 1F, 1Cl and 1C because Br is the heaviest and highest priority element. 3. Rotate the molecule so that Priority 4 atom is in the hashed wedge position. In some cases, if you can’t flip the molecule in your head or on paper easily, assign the configuration to the stereocenter when the 4th position is NOT in the back of the paper position, and just reverse the assignment. It works every time. 4. Determine the Priority sequence 1-2-3 rotates to the left (S) or the right (R). Lastly, an important concept to keep in mind is that as molecules become more complex, they also can acquire more stereocenters. Keeping in mind that each stereocenter can produce 2 stereoisomers, we describe possible stereoisomerism using the 2n rule. Let’s examine a molecule with 2 stereocenters, following the 2n rule that gives us 22=4 stereocenters. The possible combinations are listed below. We now introduce the last concept to stereochemistry which is the difference between enantiomers and diastereomers. 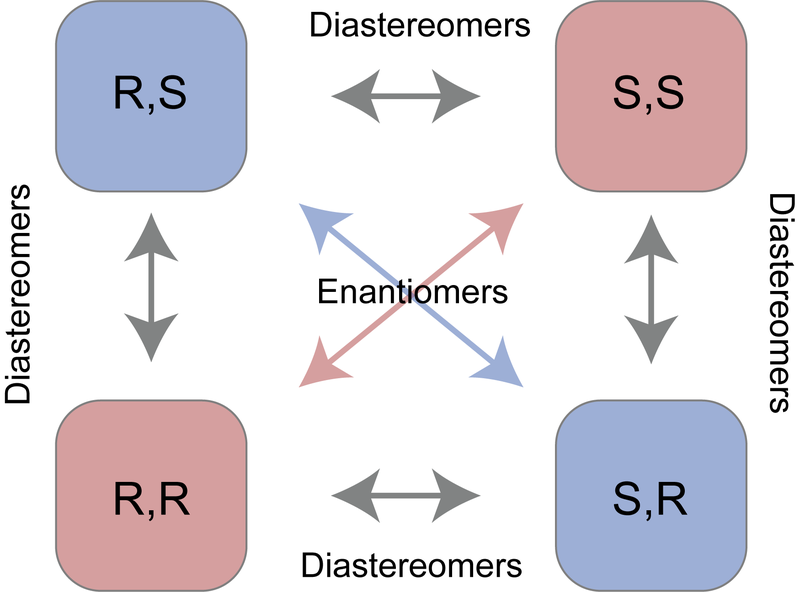 Enantiomers are molecules with exactly opposite stereoisomers. For example, the enantiomer of the molecule with stereochemistry R,R would be S,S. The relationship between molecule R,R and R,S is what is described as diastereomers, which differ in some but not all stereocenters.